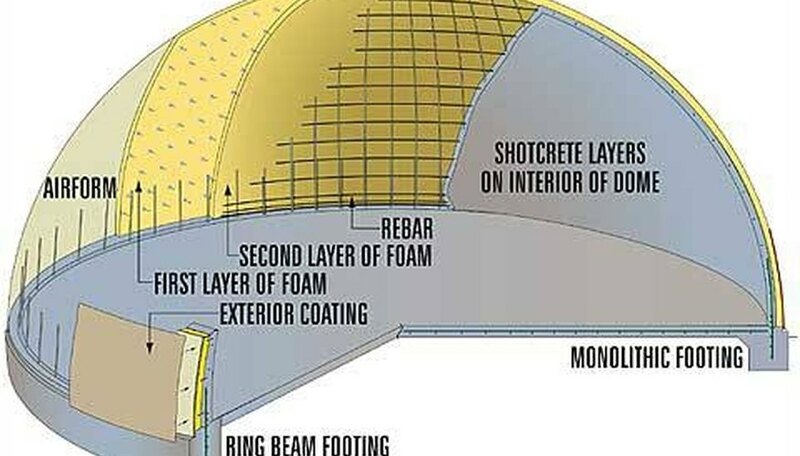 A dome-shaped building requires no interior support, and can be built using minimal materials. 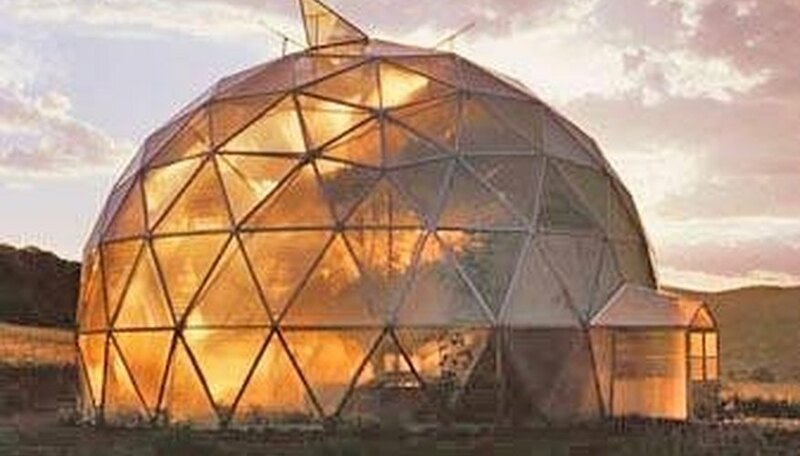 Domes come in many types, but have three basic designs: geodesic, monolithic and block. Making a dome takes varying degrees of skill and time, but the average builder could spend up to a year on the project. Decide what size dome you want. Base your decision on materials, location and size. A large, multiple-room dome used as a house takes considerable resources to complete, while you could build a simple greenhouse dome over a weekend. Determine how you want to use the structure, and calculate the exact measurements of the dome you're going to build. Decide what style of dome to build. A geodesic dome uses lengths of straight pipe set into vertex mounts. The weight of the dome focuses onto these points. A geodesic dome requires mathematical precision, while a monolithic dome is more forgiving of error. Monolithic domes are more uniform structures, made from a grid of solid rebar poles. These poles focus the weight straight down their length to the ground. A monolithic dome requires specialized equipment to construct, while the geodesic can be made with common tools. Both are usually covered in concrete once the frame is built, but they can be covered in lighter or more durable materials. A block dome is constructed as an Eskimo would an igloo. This is the easiest, but most labor-intensive of the three styles of construction. Build the dome. If you've chosen a geodesic dome, cut the chord lengths from the pipe you've selected, then bend them and bolt into place. Usually, fine wire mesh is used to give the concrete or other material an adhesive surface. Mount the wire mesh and cover with an outer covering, or set triangular glass panels. The geodesic dome will require a flat material to be placed into its triangular areas. 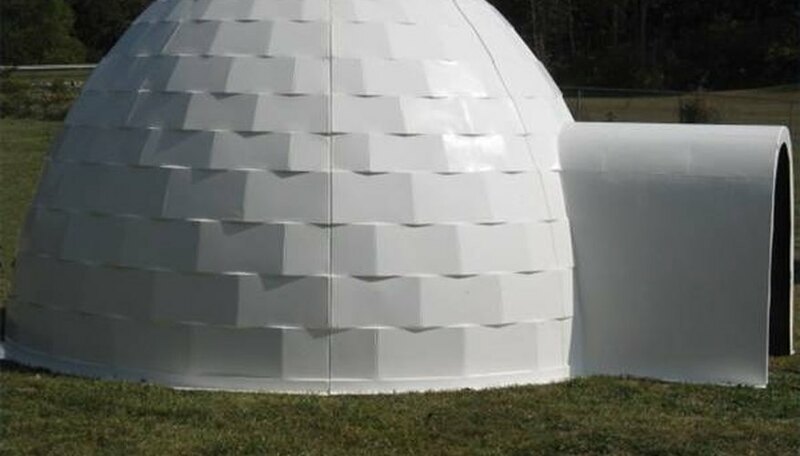 A monolithic dome is smoother and doesn't need these filler panels. You need to construct a monolithic dome around an inflatable dome-shaped balloon. Inflate the balloon to the desired size, connect the rebar rods around the shape, then pour the concrete and allow it to set. Most companies will use "shotcrete," thin concrete "shot" from a gun to fill in the shape. Deflate the balloon once the concrete is solid. If you're building a block dome, mortar any kind of bricks into a circle then continue to stack the bricks, graduating to the inside so that the dome shape takes form. Stacking bricks directly on top of one another will create a round wall, not a dome. Arrange circles of bricks so that they finish at a center "keystone" at the apex. Whatever type of dome you build, remember to leave an opening for a door. Don't climb or stand on the dome structure until it's complete. Use protective equipment when building. Eli Laurens is a ninth-grade physics teacher as well as a computer programmer and writer. He studied electrical engineering and architecture at Southern Polytechnic University in Marietta, Ga., and now lives in Colorado.